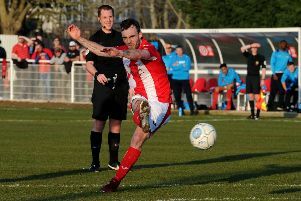 Brackley Town picked up a vital 2-0 victory over Curzon Ashton in Tuesday’s Vanarama National League clash. Manager Kevin Wilkin made several changes to his side bringing in Sam Smith for a first start since October and starting with Tom Winters on the left at St James Park. Against a strong Curzon Ashton side, in the first ever meeting between the two teams, the visitors started well and striker Matthew Warburton brought a finger-tip save from Sam Hornby in the first goal threat. Winters’ fine volley was saved by keeper Hakan Burton before his 25th minute cross found Steve Diggin who bagged his 12th goal of the season, firing home from 15 yards after a sweeping move. The Nash should have equalised on the half-hour mark when Niall Cummins’ header was brilliantly saved by Hornby at point-blank range but Luke Graham saw his header fly over from a corner at the other end. Ten minutes fter the restart Curzon were awarded a penalty when Cummins went down in the box but Hornby pulled off a full length save low to his right to deny Warburton. That save was rewarded when Saints’ doubled their advantage in the 62nd minute, Pablo Mills planting his header past Burton from Winters’ beautifully flighted free-kick. Hornby saved well from Jordan Wright and Joe Guest in the closing stages but Saints were not to be denied their first win in seven outings.